If you have ever played online casino games from the comfort of your home, you are probably well acquainted with the name of leading software developer Microgaming. It evokes a number of positive associations in the minds of regular online casino players as it has become synonymous with quality, innovations and diversity. Slot fans have Microgaming to thank for an extensive collection that spans over 600 titles, but each one of those is equally impressive in terms of graphics, animations, interface and gameplay. Surely when it comes to themes, Microgaming caters to the needs of all slot fans as there is a title to suit each player’s individual preferences and interests. Some titles were inspired by hugely popular blockbusters, others boast colossal progressive jackpots. The unparalleled diversity of Microgaming’s slot catalogue can surely overwhelm less experienced players. 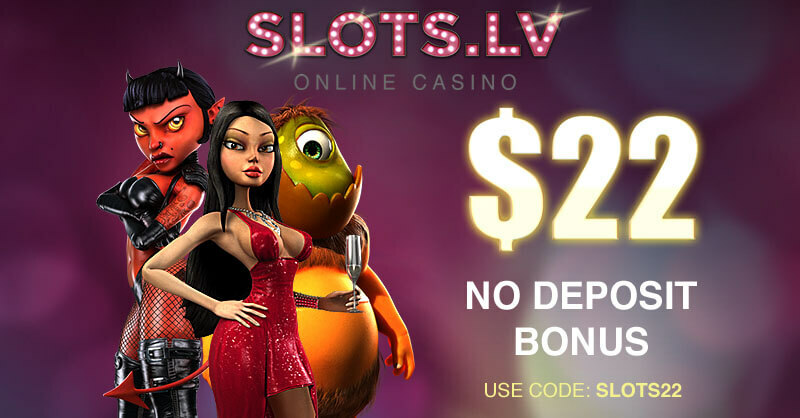 However, when choosing a Microgaming slot to play for real money, one is recommended to first check its payout percentage as some of the titles offer greater winning potential when compared to others. Choosing what slot you play wisely will ensure you generate more substantial profits. In the following article, you can find a short list of suggestions as to the highest paying slots Microgaming has developed. Microgaming claims the title of a frontrunner in the online gambling industry and this popularity is entirely justified. The company was established in 1994 and is said to have launched the first ever online casino in history, known as The Gaming Club. Shortly after this launch, Microgaming decided to veer off in a slightly different direction and offer its bespoke software to other emerging online casino operators. It was then that things really took off for the Isle of Man-based software developer. Over the past twenty years or so, Microgaming’s catalogue has expanded greatly. Today, it encompasses over 850 games, available across 450 legitimate online casinos. The company’s live dealer, bingo, poker and sports betting offerings are also highly regarded in the industry. It is fair to say Microgaming paved the way for other emerging software developers by bringing about a number of innovations to the online casino world. Microgaming’s Cash Splash became the first online slot game to be linked to a progressive jackpot network. The developer remained true to its reputation of an innovator in the industry and introduced the first slot to feature as many as 100 paylines as well as the first slot title to boast 3D graphics and animations. 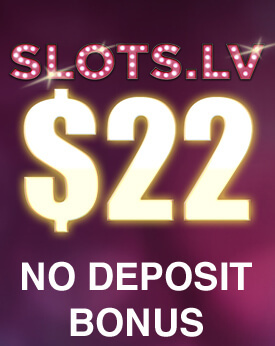 A good portion of the slot collection is also available for mobile play and runs smoothly on Android, Windows and iOS-based devices. The leading developer even made it to the Guinness Book of World Records when in 2015, the Mega Moolah slot paid out the biggest ever progressive jackpot in an online slot game to one lucky player. Despite the increased competition in recent years, Microgaming’s popularity among players remains as high as it has ever been. As Microgaming’s slots collection is indeed very diverse, less experienced players may wonder which slot titles will offer them better odds at generating greater profits. We have compiled a short list of five slots, courtesy of the respected software developer, which offer the highest payout percentages. The games can be tested in Fun mode, so make sure you check out each of the titles below to see which one corresponds to your individual preferences the most. Have you ever stepped into a tattoo parlour? 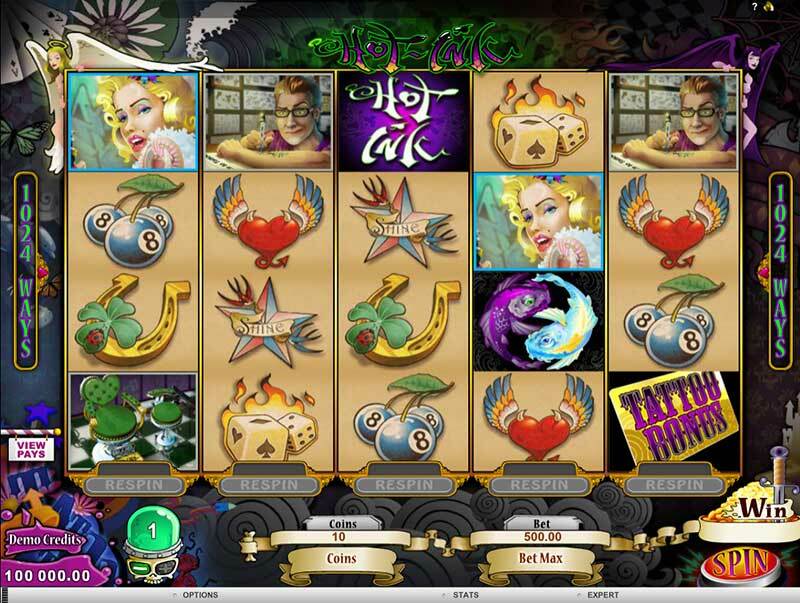 If the answer is “No”, Microgaming provides you with the opportunity to do so by playing its tattoo-themed video slot Hot Ink. The latter ranks among the highest paying Microgaming slots with a payout percentage of 97.50%. The game is played on five reels and offers a staggering number of ways to win as it is based on the popular 1024-ways-to-win format. Some of the symbols the game employs include horseshoes, flaming dices, winged hearts, and the actual tattoo designs, offered in the parlour. Players, who decide to give Hot Ink a try, will benefit from a nice range of special features. These include the Hot Ink wild symbol, the Yin Yang Koi Fish scatter symbol which unlocks rounds of 20 free spins with doubled payouts as well as the tattoo bonus symbol that is the key to unlocking the bonus mini game. In the bonus game, players will be presented with three albums of arm, leg and back tattoo designs. Players are supposed to click on each of the three albums. Three matching tattoo designs will result in 10 free spins with a 2x multiplier on winning combinations. Most players have probably read the story of the big bad wolf and the three little piggies. Well, the Big Bad Wolf slot is based on it. The game has an RTP of 97.34% and showcases amazing 3D graphics that truly are a feast for the eyes while the great sound effects further add to the entertainment value of this already impressive online video slot. Big Bad Wolf features five reels and offers players a total of 25 paylines. Some of the symbols players are likely to encounter while enjoying this slot include the three little pigs themselves and various high cards that are used as the lowest paying symbols. The wolf symbol is a scatter in the game. Get three of those on the reels and you will be awarded 10 free spins with a 3x multiplier of the winnings. 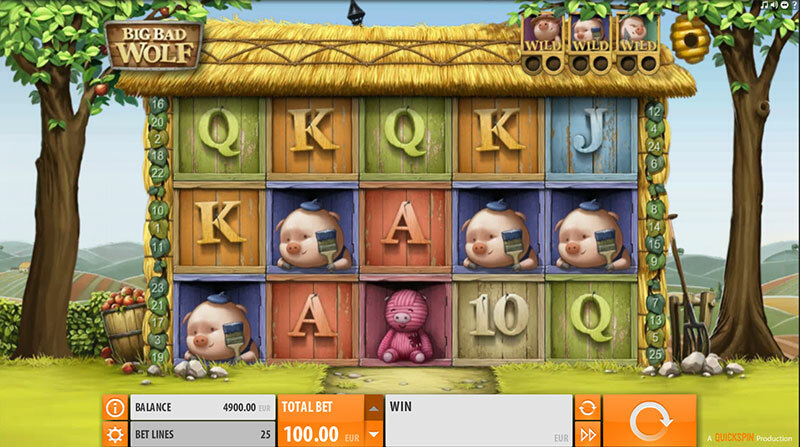 Whenever players get a winning combination, the Pigs Turn Wild feature will be unlocked where every consecutive win turns one of the three pigs into a wild symbol. There is also a regular wild symbol in the game, represented by the beehive icon. Five beehive symbols will earn you the hefty prize of 1,000 coins. The Swooping Reels feature also deserves a mention. Whenever players land a winning combination, the winning symbols disappear from the reels and are substituted by more symbols that fall on the reels from above while the new wins are added to the profits players have generated with the first winning combination. Players, who manage to land at least three moon symbols on the reels will unlock the Blowing Down the House feature and will be rewarded with 2 additional free spins. If you collect six moon symbols, you are awarded 2 more free spins with a 2x multiplier on the wins. 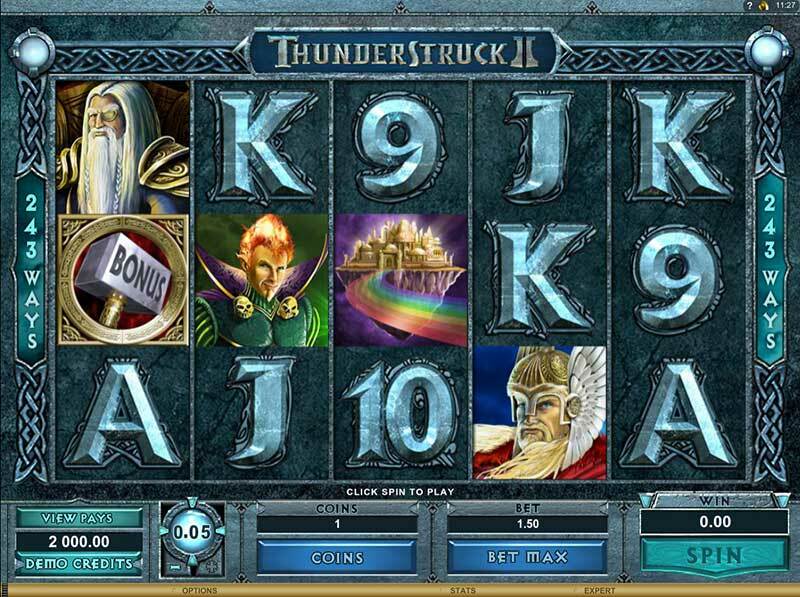 Thunderstruck II is the sequel of one of the most successful slot titles in Microgaming’s extensive collection. Inspired by Norse mythology, the five-reel game employs the popular 243-ways-to-win format and uses the mighty Thor, his father Odin, the mischievous Loki and a beautiful Valkyrie as symbols. This set of Norse deities guards a range of lucrative features and generous bonus rounds in the Great Hall of Spins. The latter records your progress so that you can benefit from previously unlocked features. The game has a huge winning potential as players, if lucky enough, can collect the largest prize of 2.4 million coins. Thor’s hammer plays the role of a scatter symbol – if you collect at least three hammer symbols, you are granted an entry into the aforementioned Great Hall of Spins. The Thunderstruck II symbol is a wild, meaning that it substitutes for all other symbols with the exception of the hammer scatter symbol. The wild also doubles your winnings whenever it ends up on the reels to complete a winning combination. Microgaming’s Immortal Romance slot is inspired by the vampire stories and films that have gained a greater popularity in recent years. 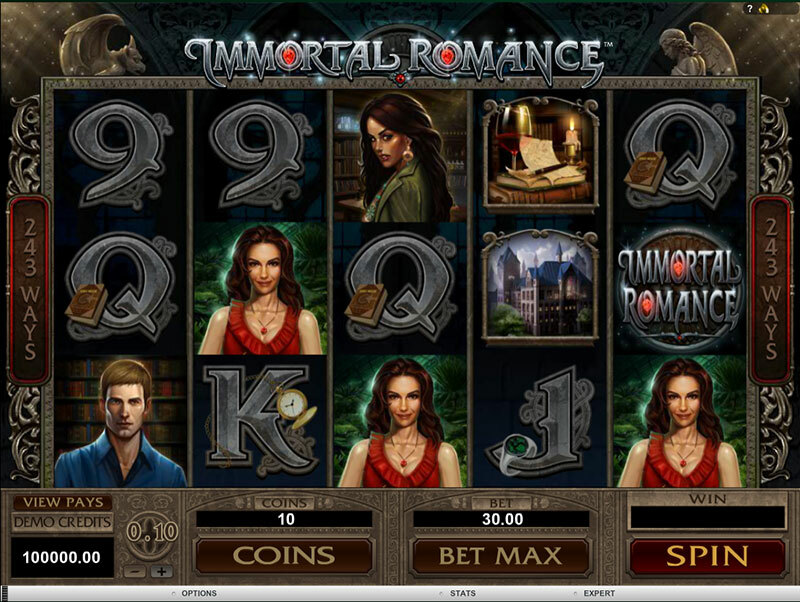 Similarly to the Thunderstruck II slot, Immortal Romance employs five reels and offers players a total of 243 ways to win. Some of the symbols that can help players form winning combinations include a witch, a beautiful young lady, two vampires, a castle and a glass of wine with an open book next to it. The Immortal Romance symbol is the wild in this game. As such, it substitutes for all other symbols except for the scatter and doubles players’ profits on winning combinations. A golden door-knocker with a lion head on top acts as the scatter symbol. If you are lucky enough to get three or more of those, you will be granted an entry to the Chamber of Spins, where a round of free spins await you. The Wild Desire feature is of special interest as it can be activated randomly at any time and carries a huge winning potential because it can turn all five reels into wilds. The RTP of Immortal Romance stands at 96.86%. 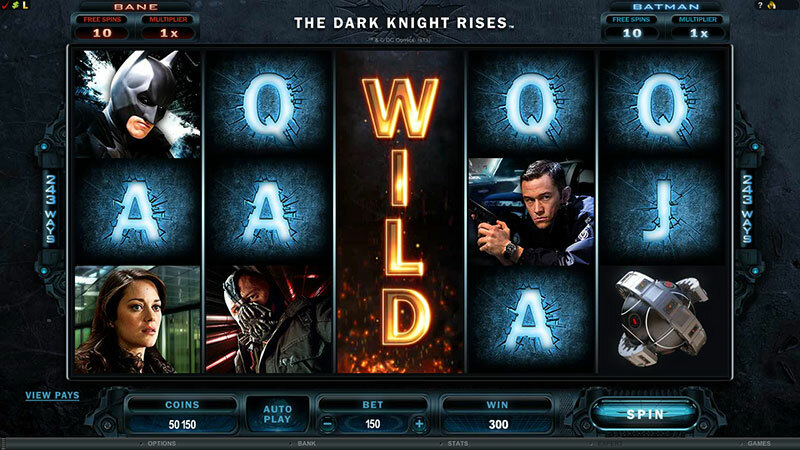 The Dark Knight Rises is a game every slot fan is familiar with. The game is based on the hugely popular blockbuster of the same name and was the first ever online slot to be optimised for the Samsung Galaxy Gear smartwatch. This enticing five-reel video slot also offers 243 ways to win and uses characters from the popular film as symbols. Therefore, players are likely to encounter Batman, Commissioner Gordon, Catwoman and Sergeant John Blake as well as villains like Talua al Ghul and Batman’s nemesis Bane. The Dark Knight Rises is packed with great features which aim at rendering players’ game sessions more rewarding and of course, entertaining. For instance, the Batman logo acts as a wild symbol, while the scatter in the game is represented by a ticking bomb symbol. Players are rewarded with rounds of free spins each time they succeed in landing three scatters on the reels. The game is indeed a feast for the senses and one simply cannot help it but admit Microgaming truly outdid themselves with this branded slot. Each time one of the winning combinations lands on the reels, the characters from the game come to life thanks to the fantastic animations. The original Hans Zimmer score that was used in the film is featured in the online slot as well. Whenever players hit five identical icons with the characters, they get to hear the voices of the actual actors who partook in the film. Apart from its aesthetic appeal, The Dark Knight Rises carries a high winning potential with an RTP of 96.30%.